We wake up early. Soon a few locals on bicycles and small motorcycles are coming by. We stop them to ask how the road ahead of us is. We get conflicting stories, from no water ahead to waist deep water ahead. 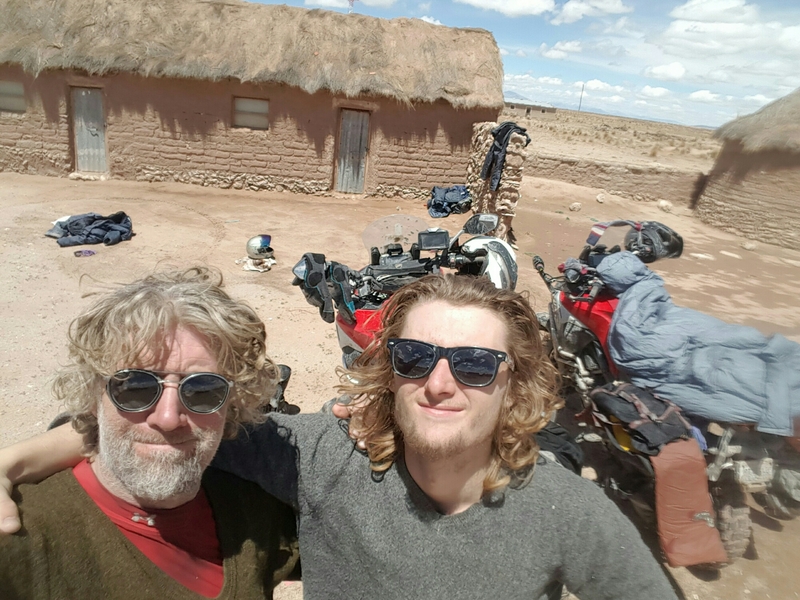 We get asked if we are riding the Dakar rally, as they know it goes through Bolivia, it ended a week ago and we answer no.A local and his son on a motorbike stop and suggest a alternate route. He is going part of that route and we can follow him. They wait for us while we pack the tent and get our gear strapped on the bikes. This route is supposed to by pass the deep water on the main road and put us back into the town we are headed for further south. We decide it sound like a simple detour and follow them. It soon becomes apparent they know the terrain well. Dodging flooded areas in the road, wandering for a bit and then back on the road. This continues for a couple hours. Getting stuck a couple times. That small bike out does us here. We finally reach the town of Ayparavi. This is their destination. They show us a route to the river to see if it can be crossed here. No way, couple foot drop just to get into the muddy river. 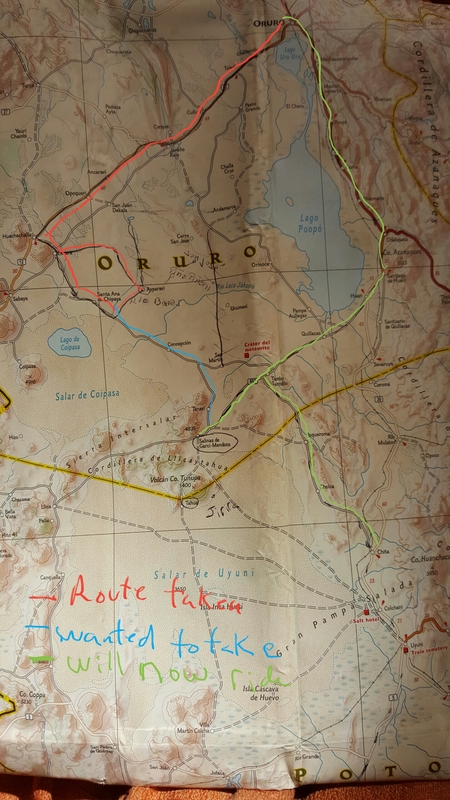 We pull out the map and he writes down a few cities we need to pass through. No routing tracks on my GPS. It would be follow the main road from here. Turns out the main road from here in my head is more like a trail. I am feeling a bit concerned at this point as the roads have water on them and and you have to find routes around them. 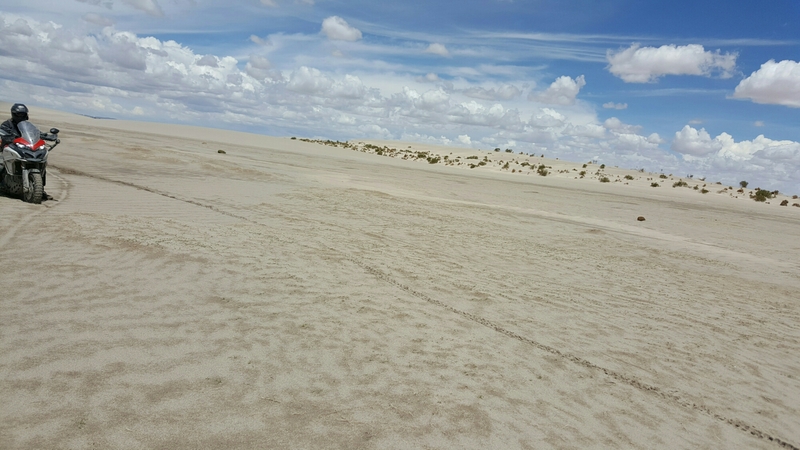 Even sand dunes shifting over the road. They say they need to work in town for a couple hours and then they will head back to Huachachalla (on the main paved road where we first hit dirt). Maxxx and I decide getting lost out here could be very easy, going further south here is a big unknown,firm paved road sounds good. 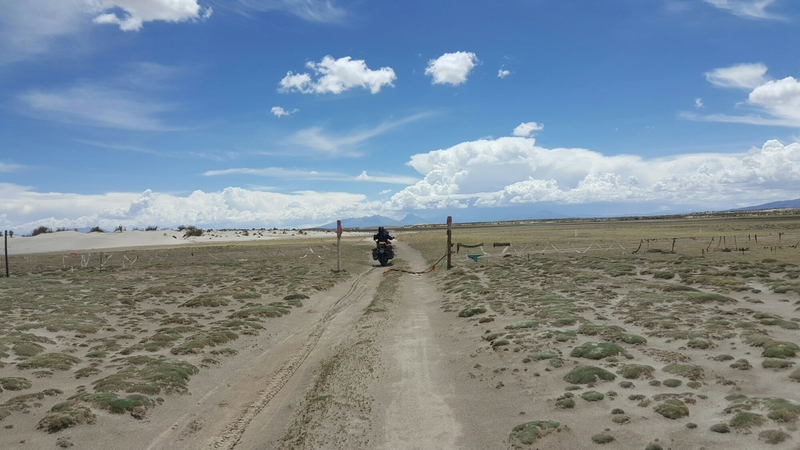 We decide we will abandon our route south and find another route to the uyuni salar. We wait the couple hours while they work. 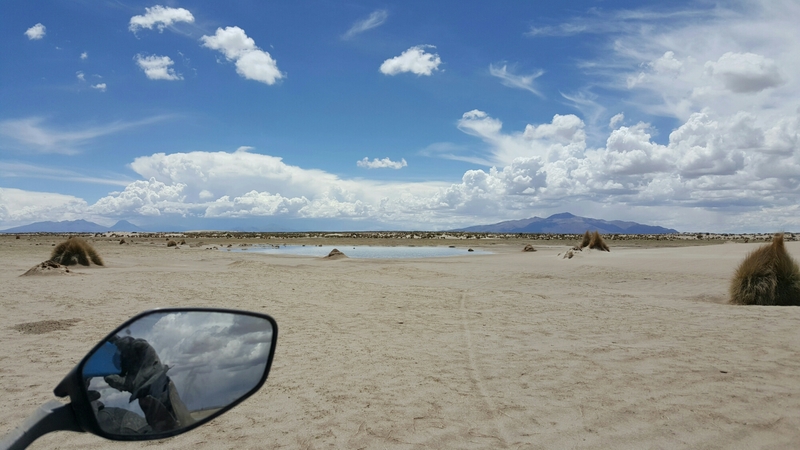 We head back for Huachachalla following them. Turns out to be a very good choice. There’s no real roads out here. They get covered by shifting sand dunes or water. There multiple roads so you just head the direction you want and sooner or later cross a road and footwear it til it ends or goes into another road you think goes your way. Not the type of navigation I had in mind without a guide. We wander with the small bike father and son team in the lead. 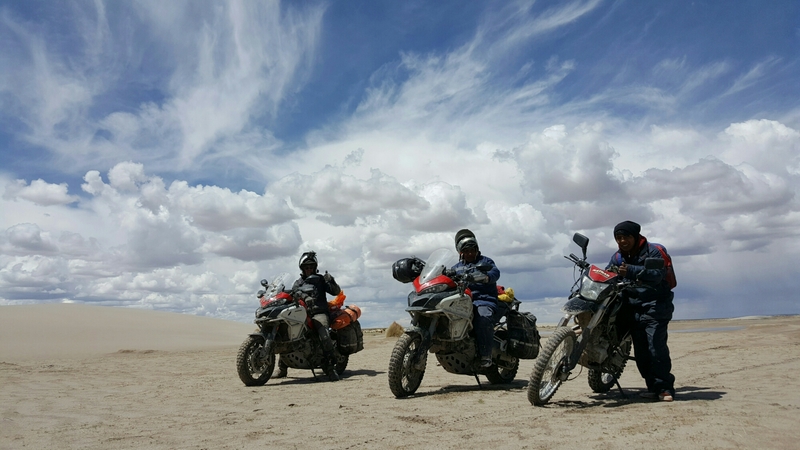 Eventually we end up at our destination, celebrate, thank them and head on good pavement back to Oruro for rest. great reporting, and awesome pics! Thanks Bronson. Gotta push forward when things get tough. Thanks for the encouraging words. Too much trouble gain to not push for what we want.anothwr day today if pushing back and forward, we were rewarded with great experiences.